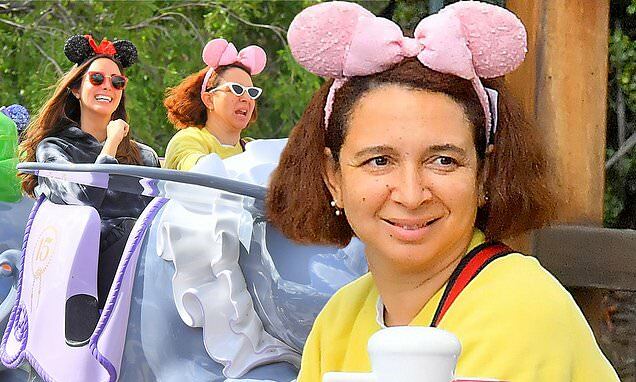 Maya Rudolph was having the time of her life on Monday. The 46-year-old Saturday Night Live vet was seen at Disneyland in Anaheim, California with friends as they enjoyed several rides in the park. This sighting comes two months after the actress delighted the audience at the Golden Globe Awards when she did a funny routine with pal Amy Poehler. While at Disneyland - aptly titled called the Happiest Place On Earth - the star was seen laughing and smiling away as she went on ride after ride. The Grown Ups actress had on a yellow top with fun pink Minnie Mouse ears on her head. The partner of Phantom Thread director Paul Thomas Anderson also had on a designer purse worn cross body style. She was seen in the Fantasyland section of the California park. The mother-of-four was on a small boat going down a river in what appeared to be the Storybook ride. Later Maya was seen in the Dumbo ride with a pal. The timing is perfect - Disney is releasing a new movie about Dumbo this week. Stars for the live fantasy/adventure story include Eva Green, Colin Farrell, Danny DeVito and Michael Keaton. Disneyland has been full of celebrity visits this year. Kristin Cavallari was seen earlier this month as was Scarlett Johansson, Serena Williams, Eva Mendes and Mariah Carey. Kim Kardashian, Katy Perry and Ariel Winter also visit the park often. In January, Maya won laughs at the Globes.